Is the food going to taste good? Thankfully, with the explosion of speciality vegan meal kits you have the opportunity to dip your toe into going plant-based, without having to five in head first. Today, we’re looking at one of the most popular plant-based cleanses on the market — Splendid Spoon. 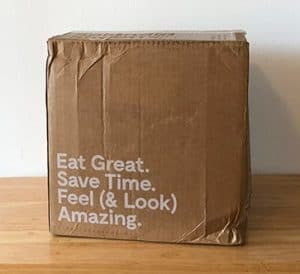 They’re a plant-based, gluten-free meal delivery service that’s designed to help you eat high-quality, nutritionally balance, and convenient vegan meals. 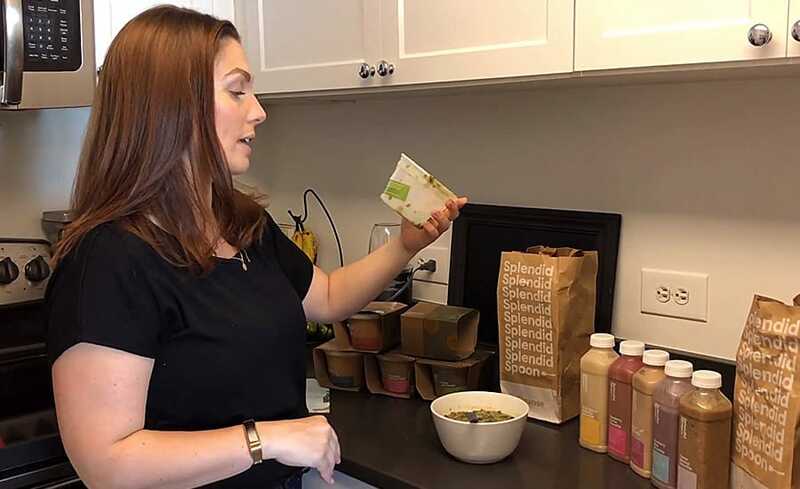 Splendid Spoon was launched back in 2013 by Nicole Centeno, a French Culinary Institute trained chef who wanted to make eating healthy an easier experience. The Splendid Spoon program is a bit different from your average meal kit (keep reading to find out why). The unique program they’ve developed for their customers is based off of research regarding diet and fasting, customer feedback, and more. To get started and place your first order with Splendid Spoon, you’ll have a couple options to choose from. You can opt to follow The Program 2.0, which is their flagship plan that’s designed to help people reach their wellness goals. This particular plan includes breakfast, lunch, and a soup cleanse. The menu rotates each week, to provide variety. 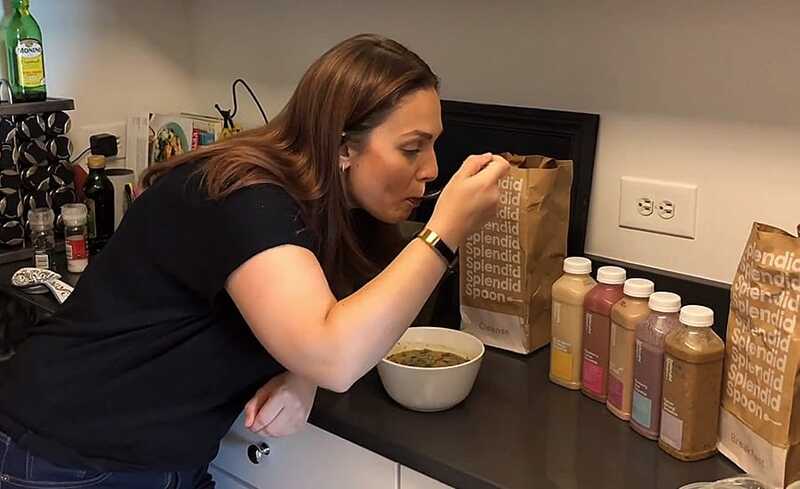 With The Program 2.0, you’ll receive five smoothies for breakfast, five lunch bowls, and four drinkable soups plus one bowl for your soup cleanse. This gets you 15 total meals each week, which have already been prepared for you. With this plan, you’ll eat their breakfast and lunch meals for five days per week. On those five days, you’ll be encouraged to choose a dinner option from their selection of recipes on their site. While they do not send any vegan dinner options, they do share two new plant-based recipes each week, all of which can be prepared in less than 30 minutes and with minimal cookware. To round out the program, you’ll do a soup cleanse one day and then the final day is your chance to eat without restraint. This “Wander” day, as they call it, is designed to help you become more aware of the food choices you make in your life. It’s essentially like your “cheat day”, but you still want to make smart food selections to ensure you’re nourishing your body. If you want to have a little more control by customizing your weekly meals, there’s an option for you as well. You can choose your meals based on what’s going to work best for your lifestyle — there’s breakfast, lunch, and soup cleanse options. So, if you’d rather skip the soup cleanse day, you can absolutely do that. When people think of going vegan, the initial thought that usually goes through their mind often revolves around taste. Vegan and plant-based meals have a reputation for not having flavor or variety. Based on the foods Splendid Spoon offers on their site as well as the foods they sent us (which we go in-depth on later) this meal kit takes flavor and variety seriously. You don’t have to worry about boring your tastebuds. Upon looking at the list of different meal options they offer the first time I peeked at their site, I was blown away. Some of the combinations seemed too strange to possibly taste good (example: Lentil & Kale with Saigon Cinnamon & Rosemary). However, I kept an open mind (and it ended up paying off in the end). Splendid Spoon delivers orders to all of the contiguous United States. Unfortunately, that does mean they’re unable to ship to Alaska and Hawaii. However, you can always check back at a later date to see if they’ve expanded their service to your area if you live in either one of those states. Each order is delivered via FedEx. You can expect orders to arrive either on Wednesday or Friday, as those are their only two available delivery days at this time. They are working to add more delivery days for their customers. Luckily, you’ll have the ability to choose your delivery day and you won’t need to be home in order to receive it. Because your food is shipped frozen, this allows Splendid Spoon to use minimal packaging that’s also recyclable, biodegradable, compostable, and/or reusable. In fact, the packaging they’re currently using has 67% fewer materials than what they used previously. The boxes and containers they use are all 100% BPA-free. The boxes, cardboard sleeves, bowls, tote bags, and the bottles you’ll find inside your box are all recyclable. The padded insulation is also recyclable and biodegradable. The plastic encasing that surrounds the padding can be recycled and the interior can be thrown in the trash since it will biodegrade. Ice packs are used to keep your food cold, which can be reused or recycled. If you want to get rid of them, simply drain the non-toxic, eco-compatible fluid that’s inside. Then, you can recycle the plastic liner. For many, making the leap to a plant-based diet is more than just changing the food you eat. It’s a lifestyle change. Going plant-based is a great way to minimize your carbon footprint so the fact that Splendid Spoon reflects this in their packaging is a great to see. All of the ingredients that Splendid Spoon uses to create their meals are non-GMO and sourced within the United States. In fact, they choose to source their ingredients within a 200-mile radius of their kitchen whenever possible to ensure freshness. Their products are not 100% organic. They are, however, working towards being fully organic in the future. For now, they do offer a number of smoothies that are organic. These are noted on their site, should you only want to eat organically. Each meal is made in small batches with fresh, whole vegetables. Then, everything is packaged immediately and flash-frozen or High Pressure Processed. With flash-freezing, they’re able to lock-in the vitamins, nutrients, and flavor of every meal. For the High Pressure Processed technique, the bottles are pressurized at cold temperatures to kill any potentially harmful pathogens and maintain the nutrition of the ingredients. These processes will keep your meals fresher for a longer period of time, but how long will they really last? If you store them in the fridge, they’ll be good for one week. However, if you stash them in the freezer, they’ll be safe to eat for up to one month. Upon opening our box, inspecting each, and actually eating/drinking them, everything we received from Splendid Spoon seemed as fresh as possible. On all of the packages they include a “best by” date so you have a good idea of when you should have it by. While this seems like a simple detail, it’s one that’s greatly appreciated. I can’t even count the number of times that I’ve gone to eat/drink a smoothie or juice that we ordered a while ago, only to find that it doesn’t have a “best by” date. Preparing your meals couldn’t be easier since they’ve already been made for you. You simply need to heat them up or enjoy them as is, depending on which one you’re consuming. 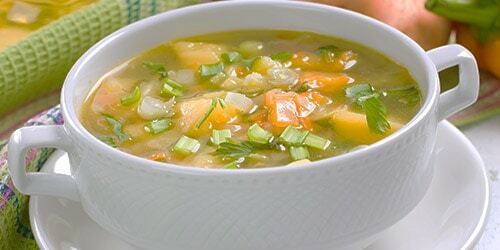 While you could technically eat the soups cold, we found heating them up in the microwave actually brought out more of the flavor. Just pop it in for a minute, take it out to stir, and pop it back in for a minute or so. The drinkables on the menu can be enjoyed cold or at room temperature. If you choose, they can also be heated on the stove or in the microwave in a bowl. 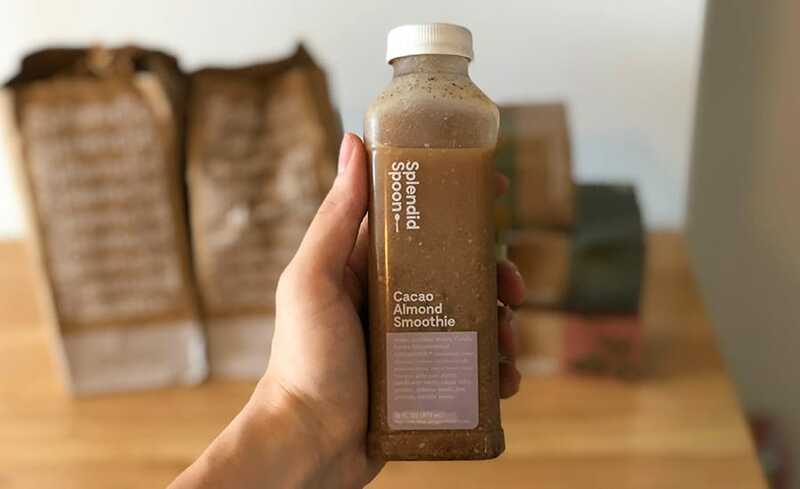 While you might think heating up a “smoothie” is kind of odd (don’t worry, I did too) Splendid Spoon smoothies are much different than what you’d consider an average smoothie. They’re packed with vegetables, spices, and more. To be honest, they’re much more like soup-smoothie hybrids so heating them up actually isn’t a bad idea. The first thing we noticed is that these smoothies are hearty. By that I mean they pack a lot into a little container and you can tell by the texture and thickness. If hearty and thick smoothies aren’t your thing and you’d rather it be more “drinkable”, just throw it in the blender with some ice cubes. That’s what we did to make it more like a juice. The first smoothie we tried was the Blueberry Acai (as seen in the video review). It definitely seemed fresher than similar smoothies we’ve purchased at the grocery store and local health food store. While I’m not usually a big fan of added protein, the pea protein in it was barely noticeable. Overall, it had a nice fruity taste. As did almost all of the breakfast smoothies. Next, we moved on to the soups. We first tried the Lentil and Kale. Since it’s fully cooked, you can eat it cold but we decided to heat it up. What we noticed about the soups is that, like the smoothies, they’re super hearty as well. Splendid Spoon packs a ton of veggies into these soups! Surprisingly, the addition of the cinnamon added a nice added kick to it. It’s safe to say I was pleasantly surprised by how well these meals tasted considering I was a bit taken aback at the ingredient combinations prior to ordering. Since everything is made with healthy ingredients, it’s nice to have nutritious meals that also taste great. Food that’s healthy, tastes good, and is convenient to cook/eat is usually hard to come by. Splendid Spoon definitely makes it easy. and the 1-Day Soup Cleanse (4 drinkables + 1 bowl) – $65. Your first thought might be that it seems like a lot of money. However, you should consider how much you’re currently spending on groceries and eating out each week. And how often are you tossing out ingredients that have gone bad before you’re able to use them? Also consider how much time you spend going to the grocery store, buying all your food, figuring out what to cook, making it, and cleaning up all the dishes. If you do the math, you’ll probably find that you spend a ton of time just buying food, cooking, and cleaning up. You pay for Splendid Spoon to take care of all of that for you. Incredibly convenient. Everything is pre-made and you don’t even need to heat up the meals since they’re drinkable. Will save you time. Regardless of the reason why you’re thinking about using Splendid Spoon, it will help save you time. You can cut out going to the grocery store, planning/cooking meals, and even clean-up (since you just recycle the smoothie bottle). Makes going vegan easy. There’s a lot to consider when you make the switch to a plant-based lifestyle. First of all, what are you going to eat without animal products? It’s a lot harder to find vegan products than you might think. Second of all, there’s a lot of planning involved since you need to make sure you’re getting the right amount of nutrients. You won’t be getting animal proteins. Splendid Spoon takes care of all this, which can be a lifesaver for those new to going vegan. A lot of variety. Vegan meals can be limiting due to the restrictions. Splendid Spoon currently has 40+ different meal options. Drinking meals can get boring. Everyone is used to biting into, chewing, and eating their meals each day. 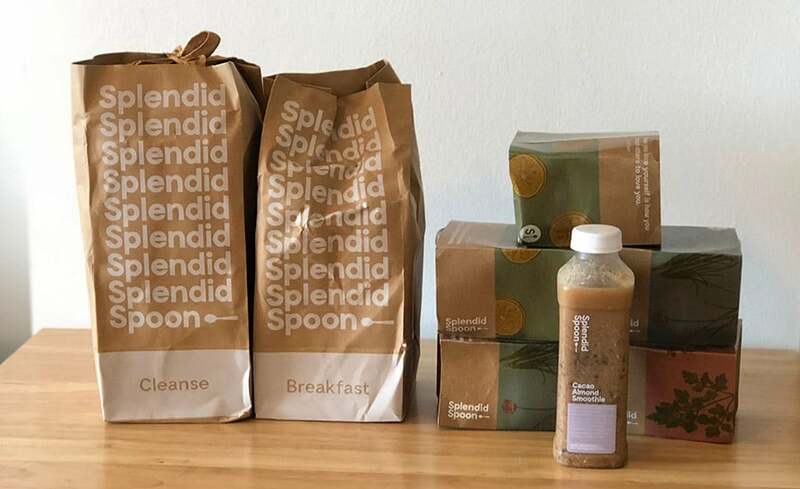 So when you switch to a meal delivery service like Splendid Spoon that only sends “drinkable” meals, it can be tough to transition. Does not include dinner. They only offer two meals per day in their plan. Can be a tough transition at first. If you’re someone who is looking to start a plant-based diet but hasn’t yet, the switch can be a bit tough at first. Splendid Spoon is a great option for someone who is looking for a plant-based meal delivery service that’s super easy to use, cook, and eat. Using our Splendid Spoon goodies over the week, I realized they’re perfect for those who are on-the-go and live busy lifestyles. Everything is packaged relatively small so you can fit it in a briefcase or pure pretty easily — just grab and go. Also, there’s no need to worry about cooking or even heating them up. I found myself grabbing a smoothie on mornings and drinking it on the way to meetings. In my opinion, what makes Splendid Spoon stand out among the other vegan meal delivery services (beyond their unique program) is the fact that they work with an advisory board to develop all of their meals. This board includes a registered dietician, a specialist on energy homeostasis, and a professional chef. This gives me peace-of-mind, knowing that my smoothies and soups aren’t just a hodge podge of random vegan ingredients. And while it is a bit more money than making soups and smoothies yourself, I will happily pay extra for convenient and nutritiously balanced plant-based meals. Overall, I’m really impressed with Splendid Spoon.